Ice hockey has got to be one of my favourite sports to watch on television. Unlike golf or cricket, ice hockey draws you in regardless of whether you’re on the sidelines or watching from your couch. 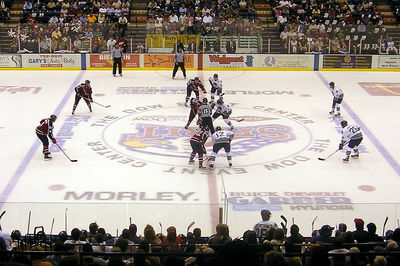 Do you enjoy watching ice hockey on T.V.? Would you like to see more Ice hockey on television? I find it funny but many Canadians would call it blasphemy or unpatriotic, but I'm just not a hockey fan. I'll watch the occasional game, and I'll enjoy it, but I don't choose to watch hockey on my own. It's just not for me. I'm an Aussie and I love watching the hockey but have trouble keeping track of the puck. Hockey and Aussie rules football have a lot in common. Speed, accuracy and a bit of biffo. What more could you want in a sport? No, I am actually scared watching this as saw a very bad accident once on a skating rink. This seems very rough and I do not watch it on any of the winter games. Terrible things happen in other sports, but I guess this 'terrible accident' really scarred you then. I used to live in Canada, but never really got into ice hockey, so I am right there with dgrwriting. Now, I have a husband and a son who are mad sports fanatics. So I am assuming, if ice-hockey was telecast here in Australia, it would take some TV time in our household. I've never seen ice hockey listed on our channels. I find that amazing, because hockey is such a staple here, but at the same time I've never really thought about the fact that we rarely get UK football available for viewing and we never get Australian Football. I get surprised by similar things that I find are not shown or available in Australia, but are in the UK. It is interesting to find out the differences. Nope don't like hockey. I think it was the only sport I didn't watch during the Olympics. No, no interest in it or 99% of sport shown on TV. As the late, great Ruth Buzzi used to say, 'B o r i n g'! I’d watch if it was shown in Australia! Do you like when your favourite television dramas incorporate current events into their episodes?